The other week I started making spring bunting. Well I've carried on down that route, and now I've got quite a merry little string of contrasting patterns and textures. I used my basic pattern, but played around with it to mix things up and add variety. 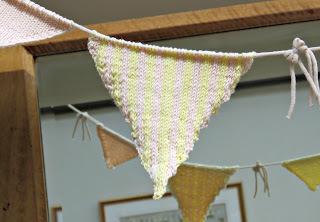 I'm using Costa Brava Knitting's 4 ply organic cotton range - colours Rose Blush and Honeysuckle, and I'm knitting on size 11 (3 mm) needles to a tension in stocking stitch of 26 stitches x 36 rows on a 10 cm x 10 cm square. First up is a very easy variation. 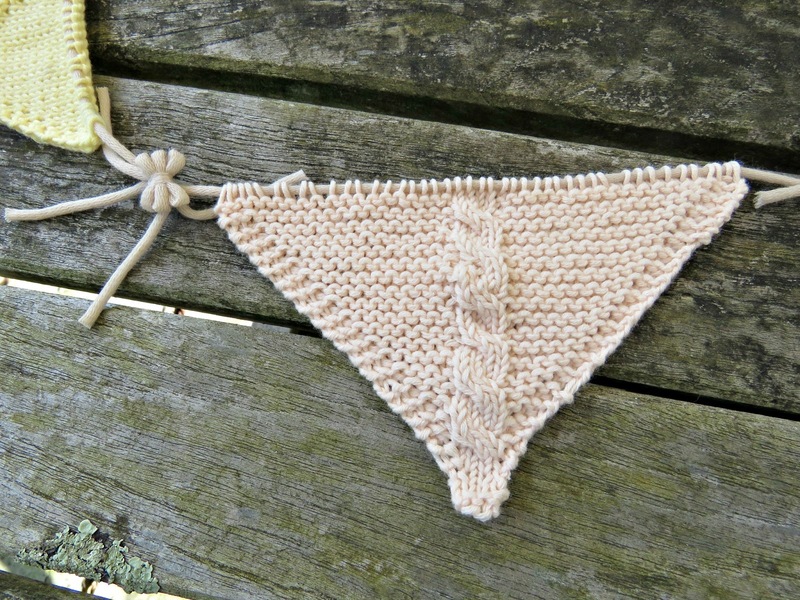 This is the basic pattern worked in garter stitch as opposed to stocking stitch. 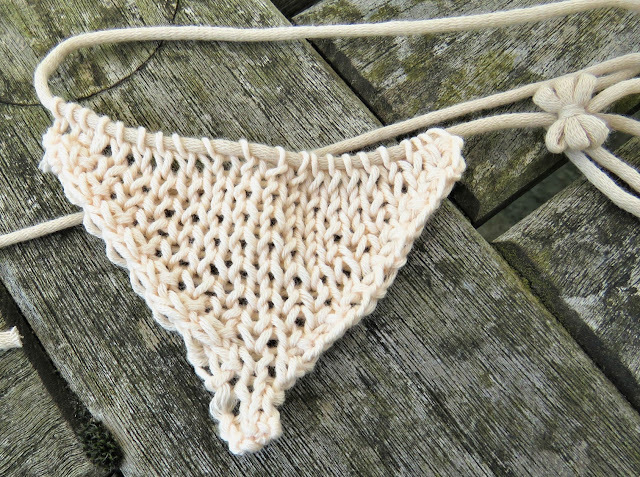 It really couldn't be easier: just follow the pattern of increases and purl both the odd and the even rows. 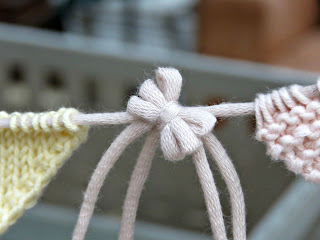 And then thread onto the bunting string - as before - without casting off. I also did another triangle in seed stitch. Basically use the same pattern, and knit 1, purl 1 all the way down your rows, being careful to do the opposite to what you did on the previous row as you go, making tiny seeds out of the knit stitches placed on the purl stitches of the row before. 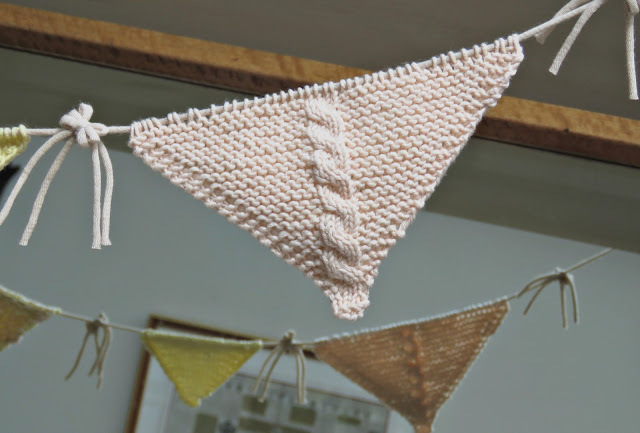 It will pattern in this way naturally as you've got an odd number of stitches on each row, so if you knit 1, purl 1 all the way along you'll have it sorted. 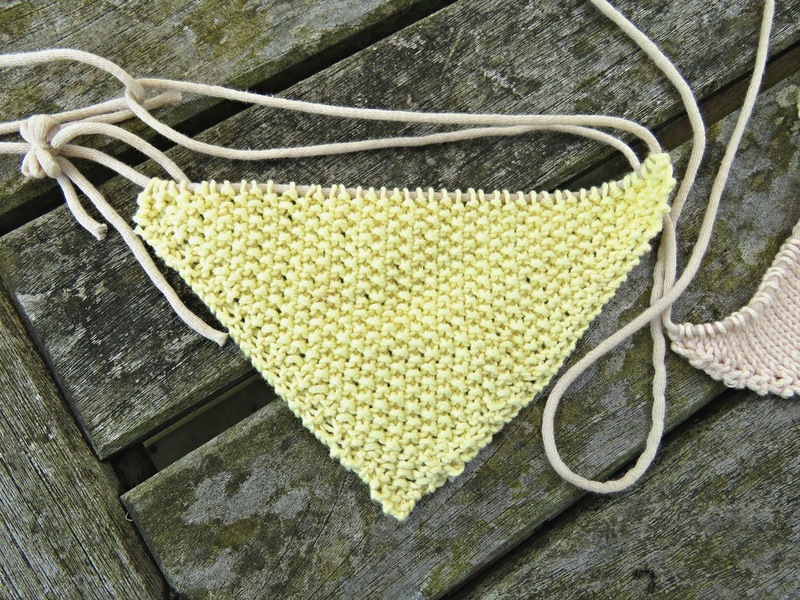 There's no denying that all these little triangles give you a great chance to play and have fun with your yarn. Next up I tried a triangle with a 4 stitch front cable twist at the front. This needs an even number of stitches, so instead of casting on 3 stitches, you'll need to cast on 4. Increase one stitch either edge every purl row, working in reverse stocking stitch on either side of the central 4 stitch panel, which is worked in stocking stitch with a front cable twist (slip 2 stitches onto cable needle, leave at the front, knit next 2, then knit the 2 stitches on the cable needle) every 6th row. Keep on going until you have 44 stitches, ending with a knit row on the front 4-stitch cable panel. Next up I tried to do some vertical stripes. I started off with 3 stitches in yellow, and then added the contrasting colour in 2 stitch stripes on either side, carrying the non-active yarn across the back of the work as in Fair Isle knitting. Otherwise I followed the original pattern exactly. 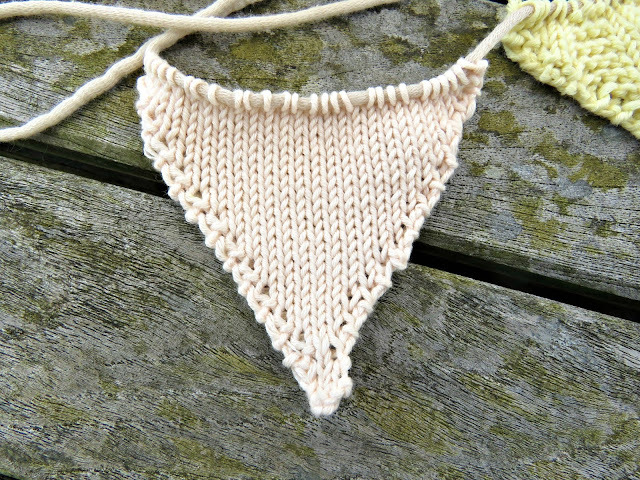 And you'll notice that I'm also doing some small triangles as a contrast to the larger ones. 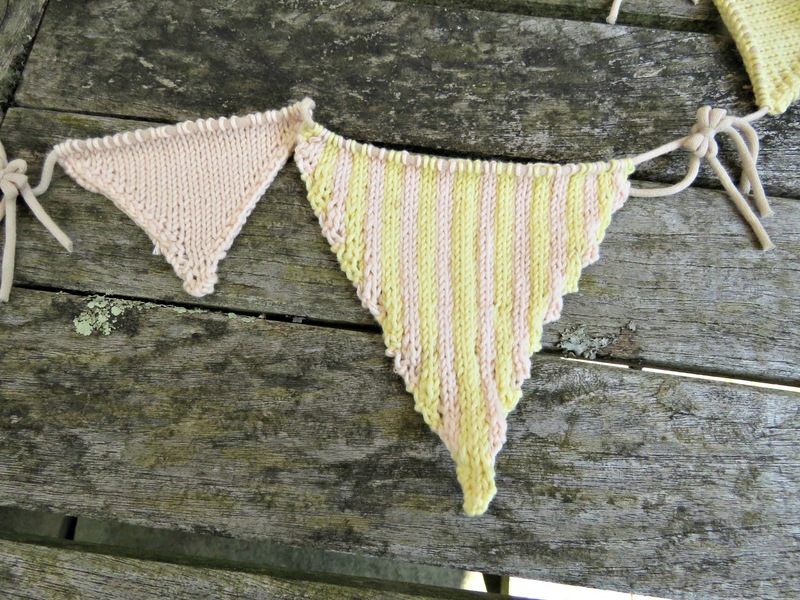 These are worked on the same pattern until there are 27 stitches, ending on a knit row (row 27). 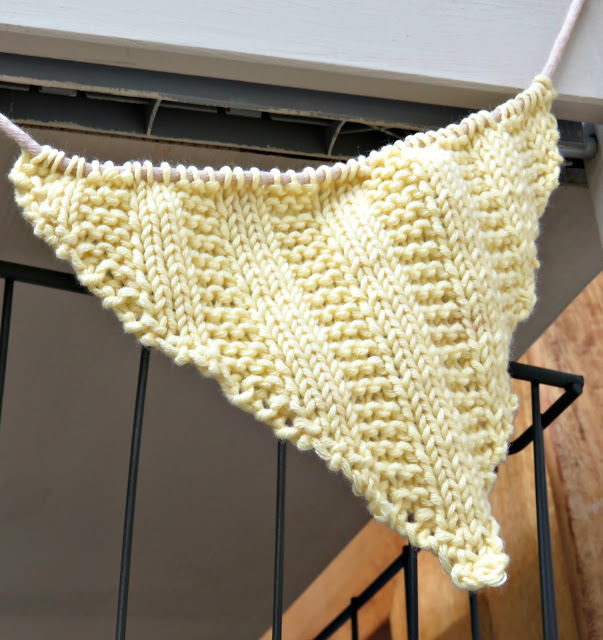 I worked one of the small triangles in a looser texture by using stocking stitch, but doing all the purl rows on a UK size 5/ 5.5 mm needle and all the knit rows on a size 11/ 3.00 mm needle. 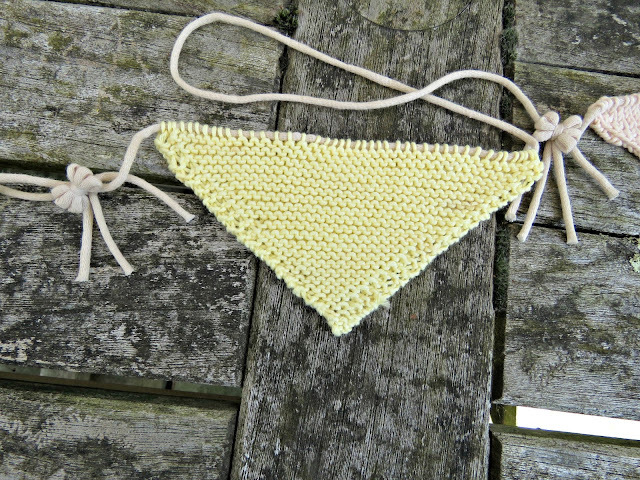 This would be a lovely textile to use for a loose-knit summer jumper. 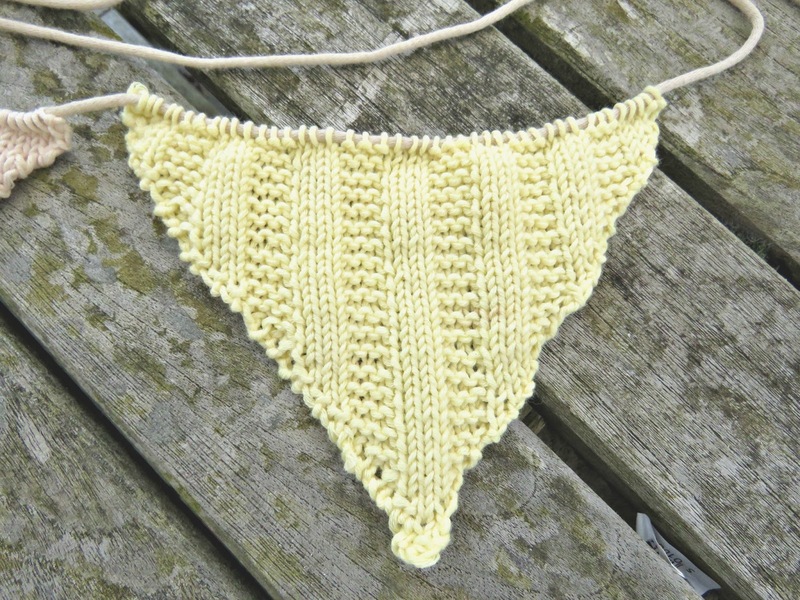 Next up is a large triangle worked in contrasting stripes of stocking stitch and reverse stocking stitch. The central panel is worked in stocking stitch, the three stitches to either side are worked in reverse stocking stitch and so on. I've used T-shirt yarn in a contrasting colour to string the bunting on, and every now and then I've attached a little bow to the bunting string, made in the same yarn using the prongs of a fork. Do you know how to do this? You wind the yarn around the fork three times, and then tie the loops by coming through the centre with another piece of yarn at right angles to the loops. Really easy! And that's about it. Roll on the summer! 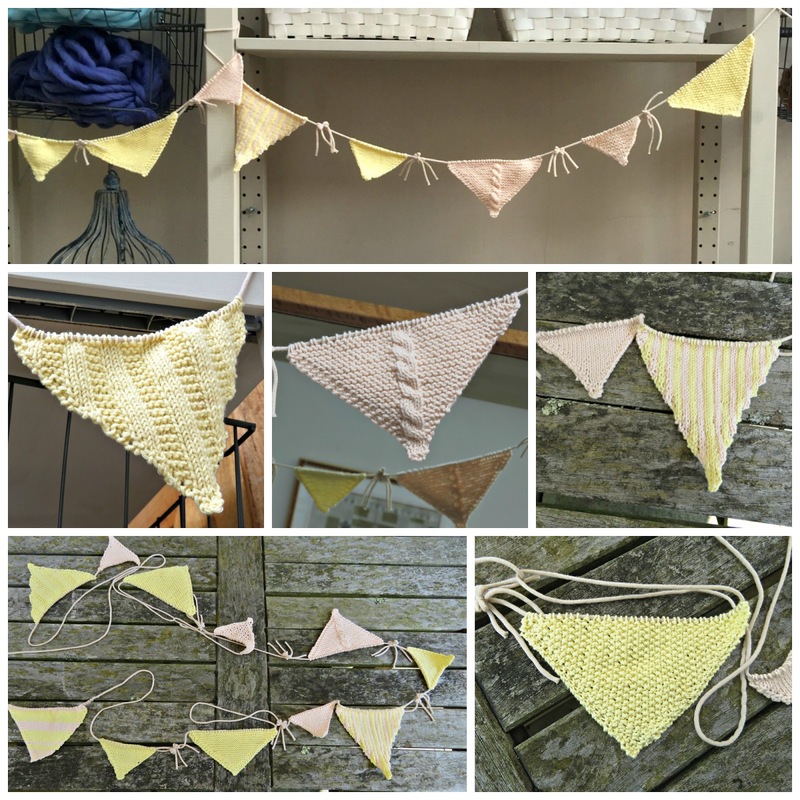 Very cute idea for bunting. Although it sort of reminds me a bit of a bikini bottom for some reason. You are lucky to know how to knit, I'm horrible with stuff like that.